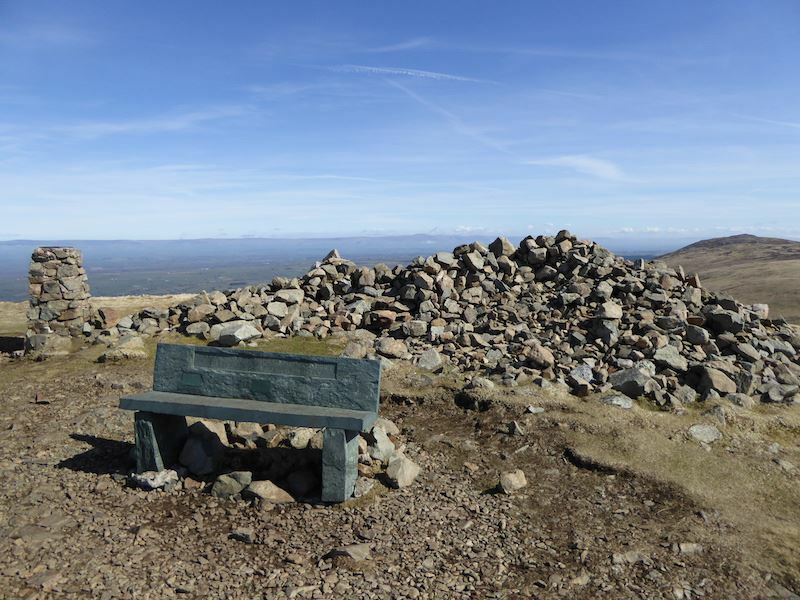 Its Easter Monday and its set to be a fine day so that means we need to avoid the popular fells as car parking will be at a premium today. 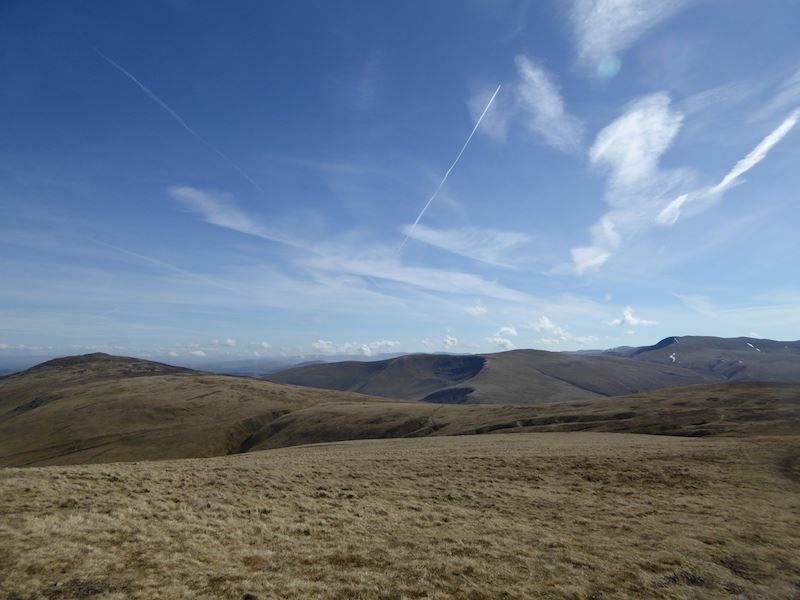 Where better then to find a bit of quietness than the open moorlands of the Northern fells? 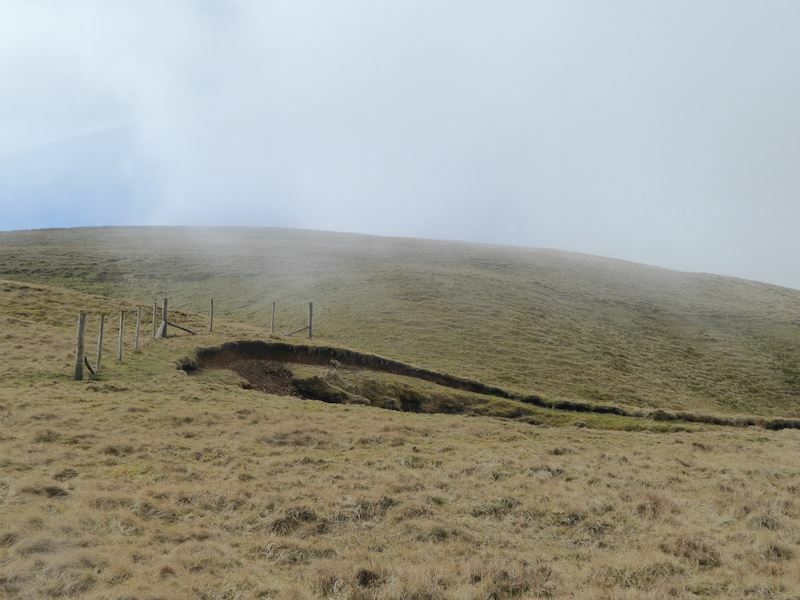 This is our starting point at Calebreck and as you can see its a bit on the foggy side at the moment. This was taken just before noon and the fog is only now beginning to thin out. 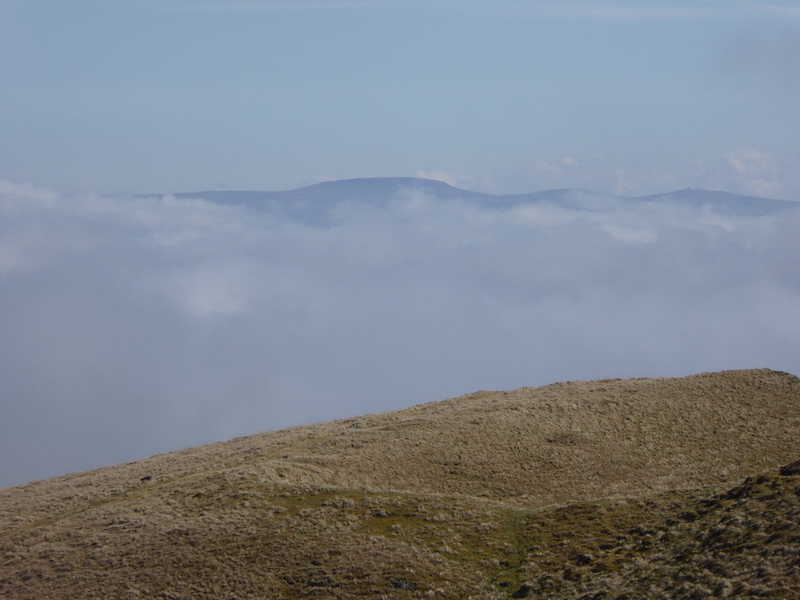 The fog clears enough for a glimpse of Carrock Fell as we set off from Calebreck. 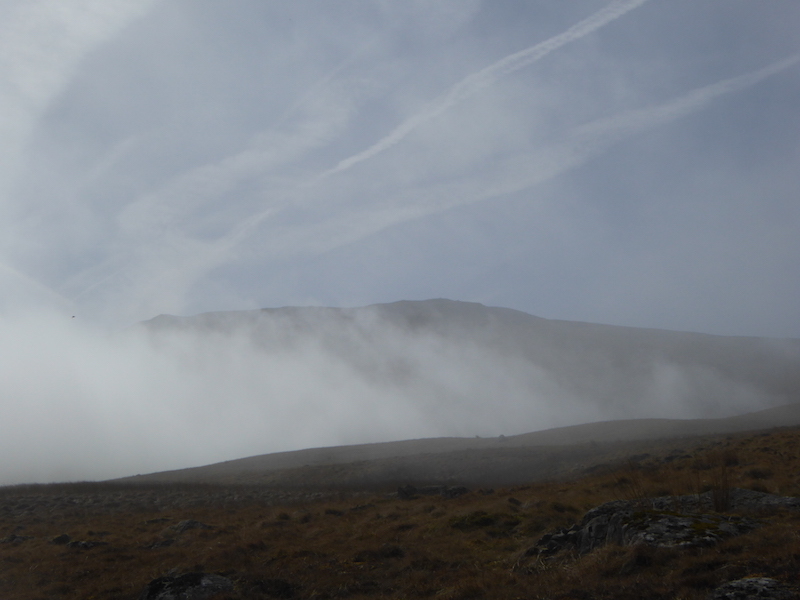 We had been walking in thick fog for a while and hadn’t been able to see more than a few yards in front of us, so it was a relief to see it clearing away and to be able to see landmarks again. 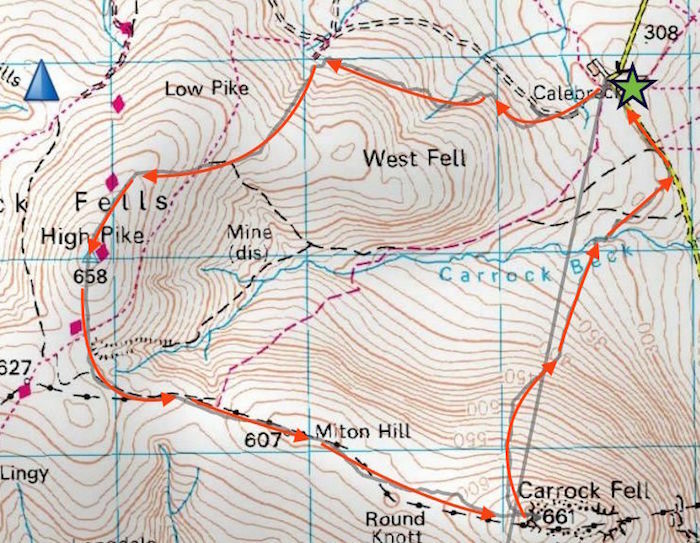 Making our way over West Fell round the partially fenced off mine shafts. A few minutes ago we wouldn’t have been able to see this until we were about to fall down it. 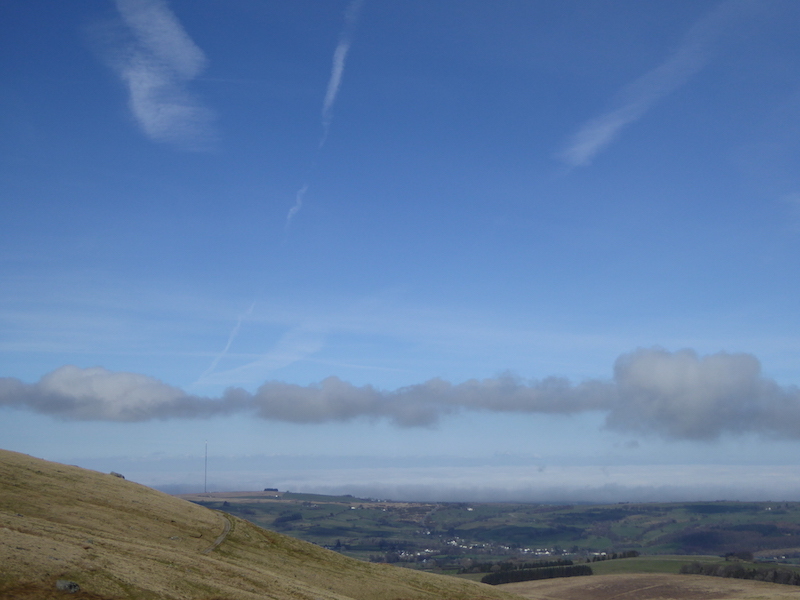 There’s a huge inversion everywhere, the hills in the distance are the Pennines with some of the tops just clearing the fog. 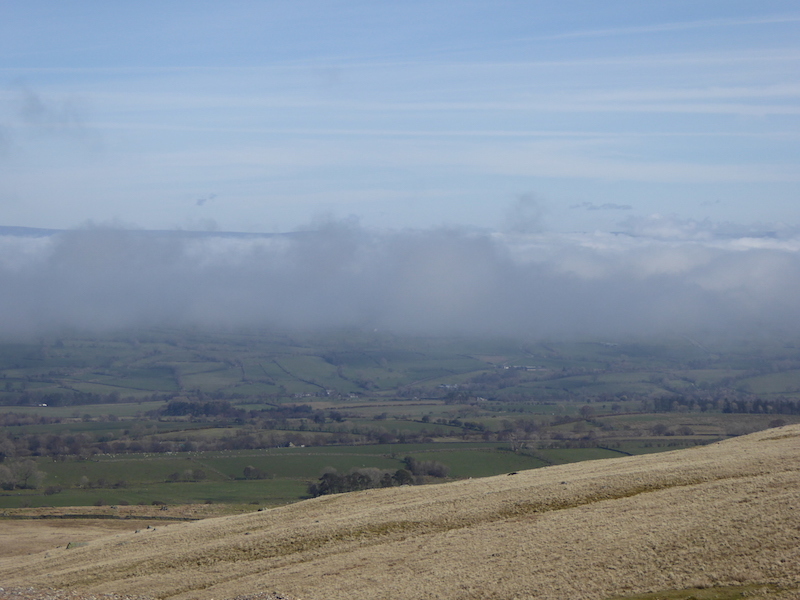 A sea of cloud everywhere but it is gradually thinning out. The fog is gradually dispersing and brighter skies are coming in behind us from the west. 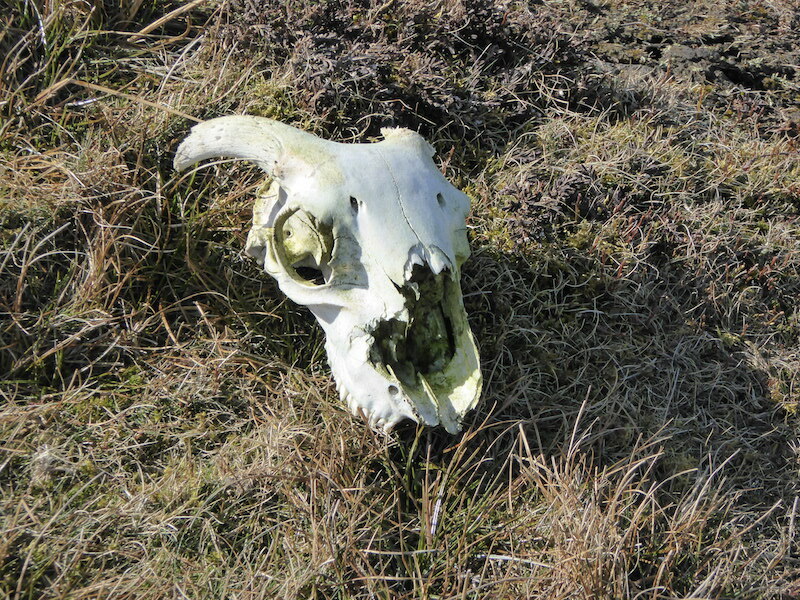 A close up of Cross Fell over on the Pennines with nothing much to see in between. 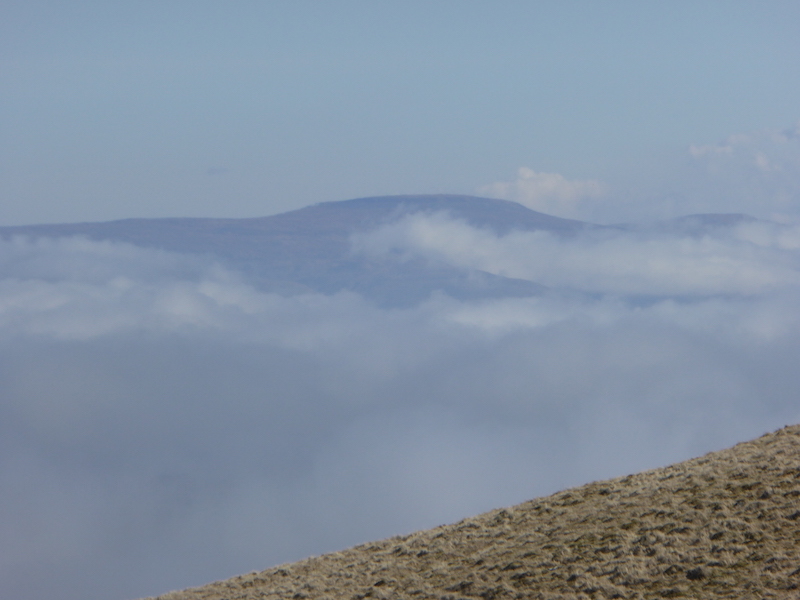 At last, a view of Carrock Fell as the fog drifts away to the east. 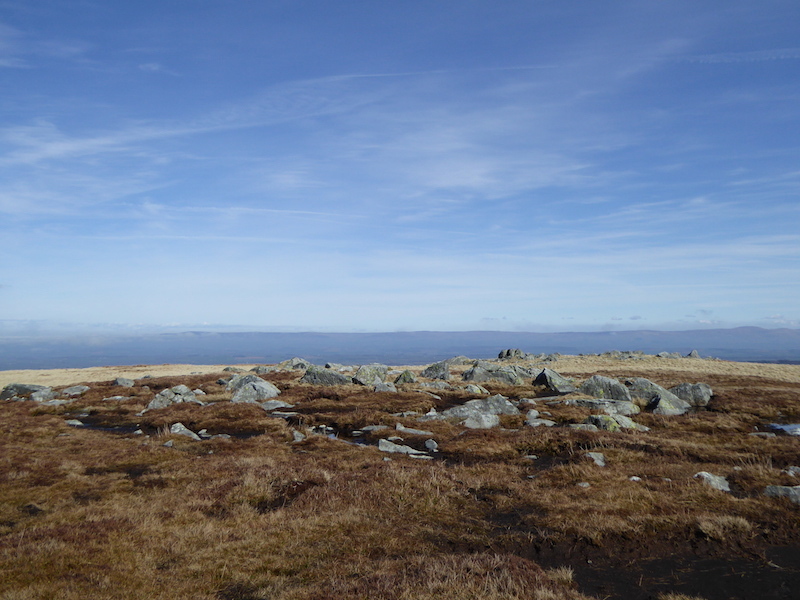 There goes the last of it, now we can see Great Mell Fell on the left horizon. 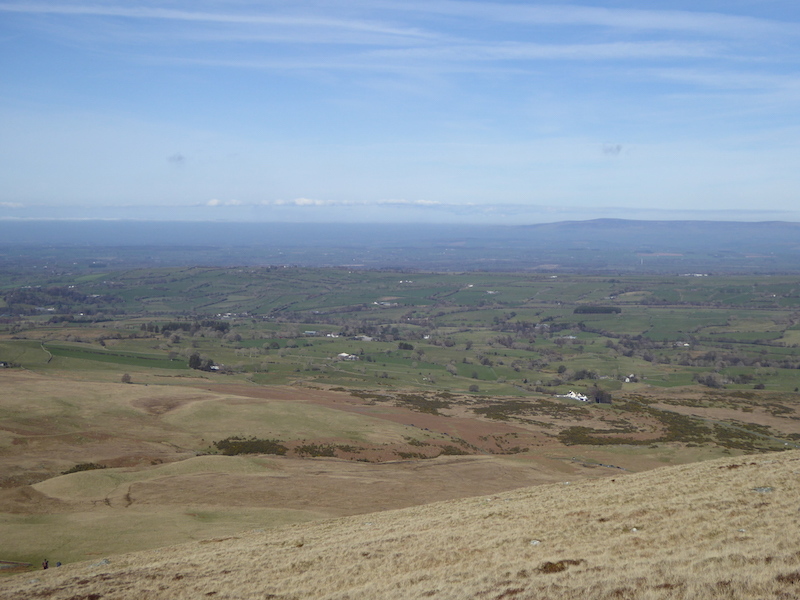 Another view over to the Pennines now that they can be seen more clearly. 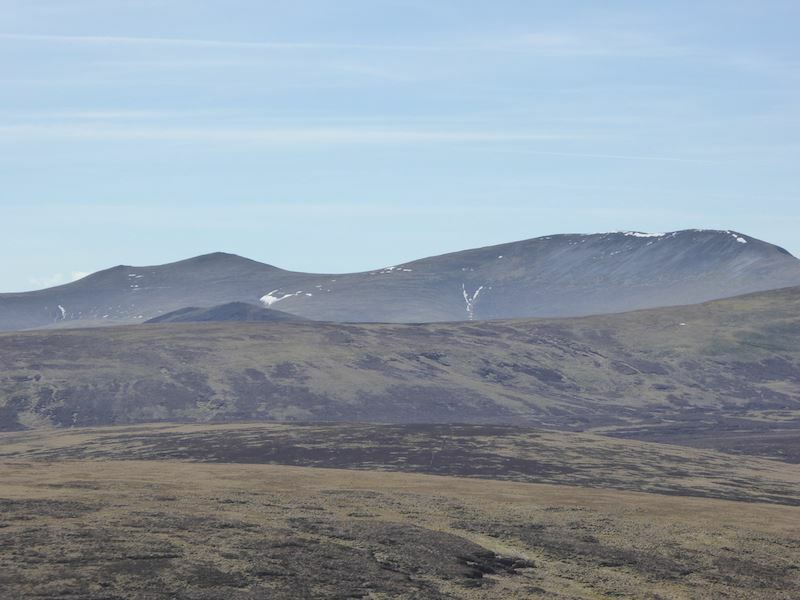 Still making our way up to High Pike and there’s Carrock Fell over on the left, with Blencathra just peeping up on the right. The high altitude winds are turning the contrails into abstract patterns. Its turning into a fabulous day. 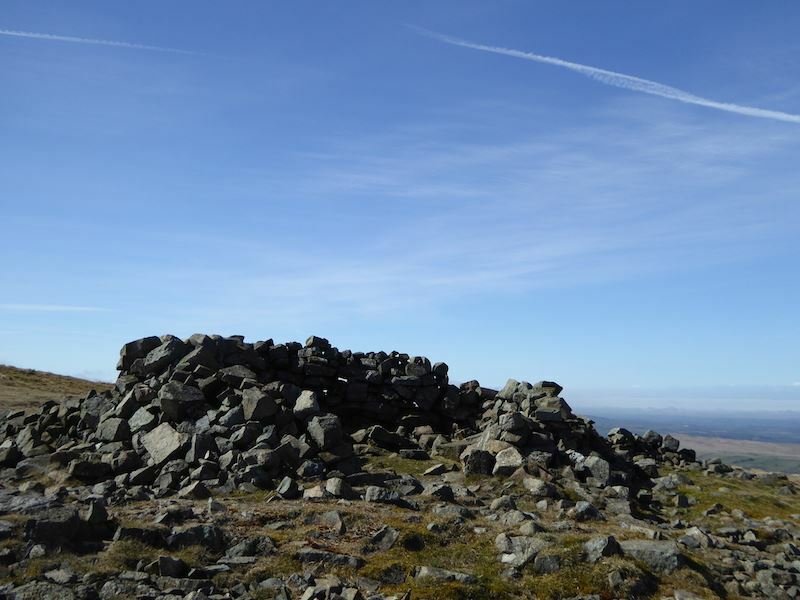 The lower shelter on High Pike. 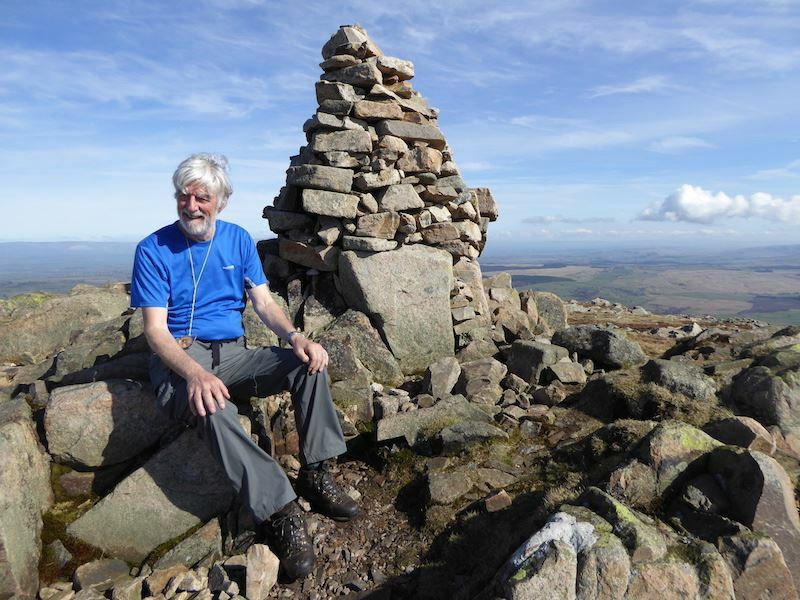 Lots of information on the top of the trig column on High Pike. 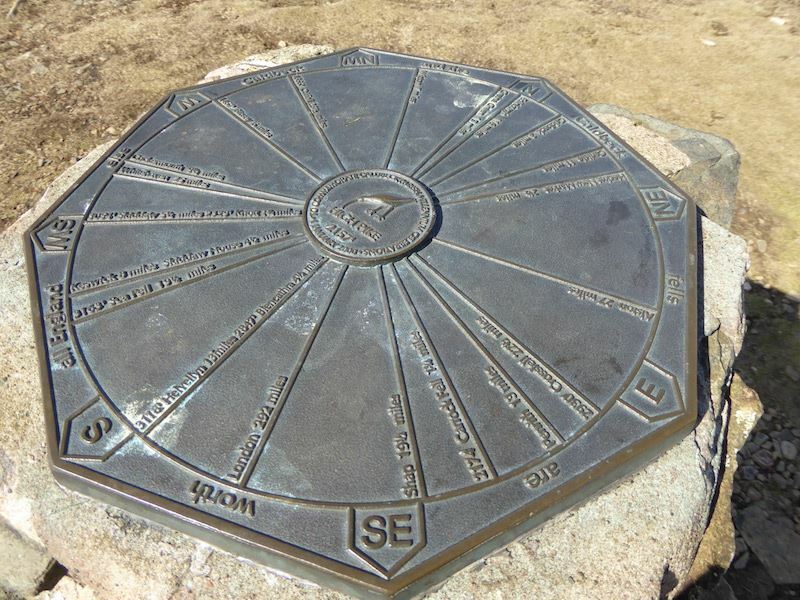 Amongst other things, its telling us that we’re facing north-west and standing at 2175 feet above sea level. Strictly speaking I was about a foot higher than that as I had to find footholds on the lower stones of the column in order to get this shot of the information plate. Good thing there was no-one else around at the time as I must have looked a bit strange with my feet on the stones and my knees gripping the column. Well I needed both hands to deal with the camera didn’t I? 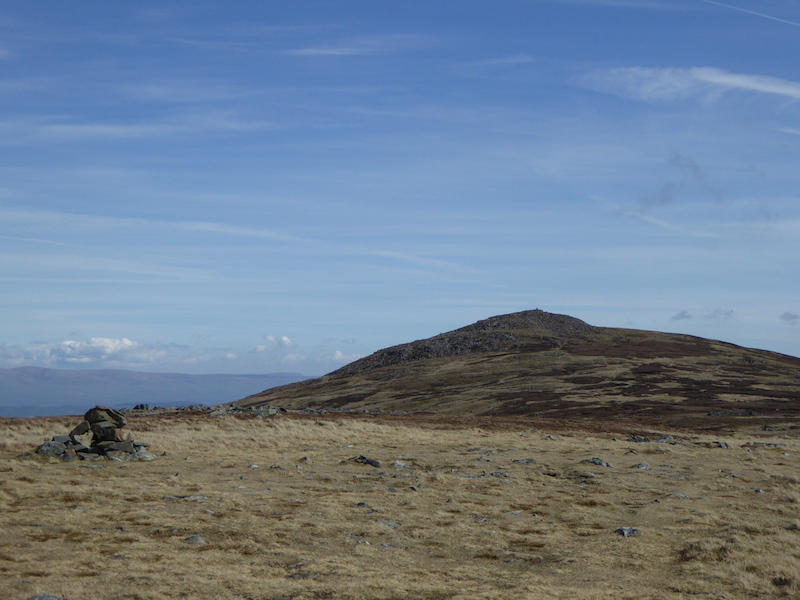 High Pike summit with Carrock Fell just over on the right. That bench will come in very handy in a minute or so. 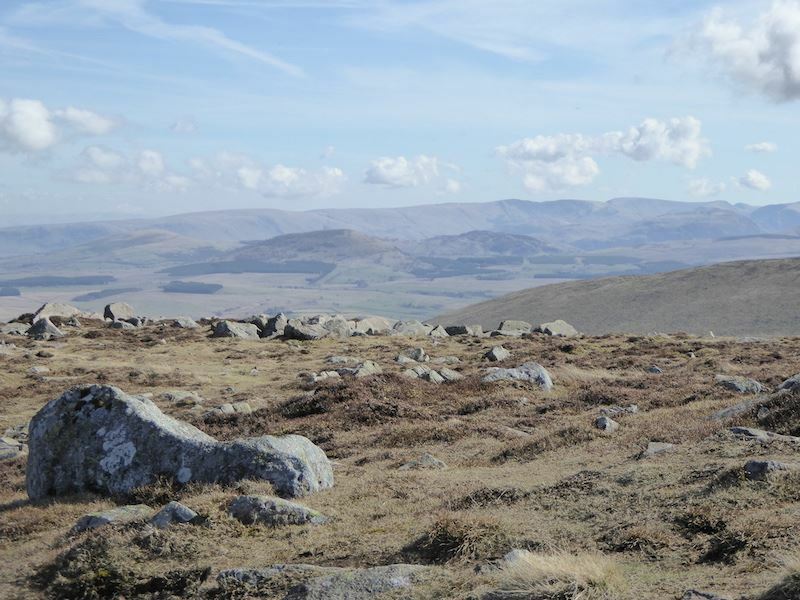 The view from High Pike summit, with Carrock Fell on the left, Bowscale Fell in the centre and Blencathra, still with some snow patches, over on the right. 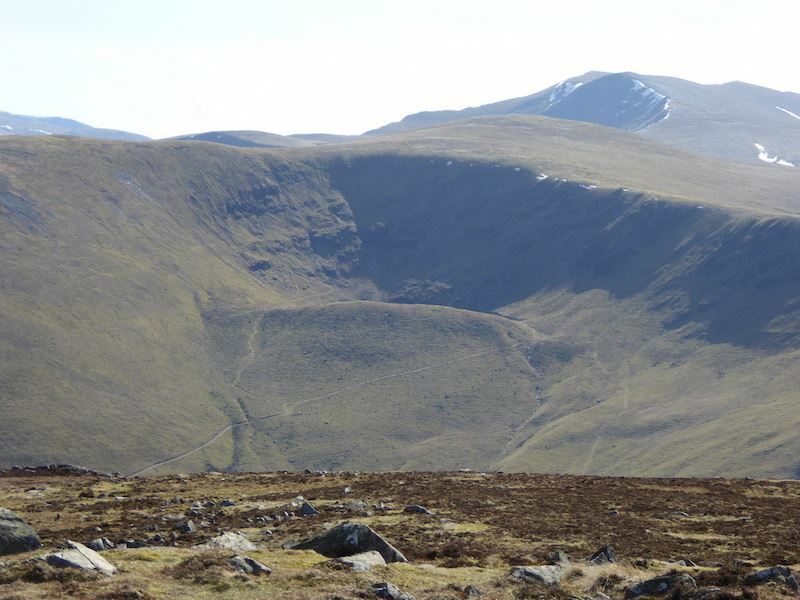 A close up of Blencathra with the profile of Sharp Edge in the shade. 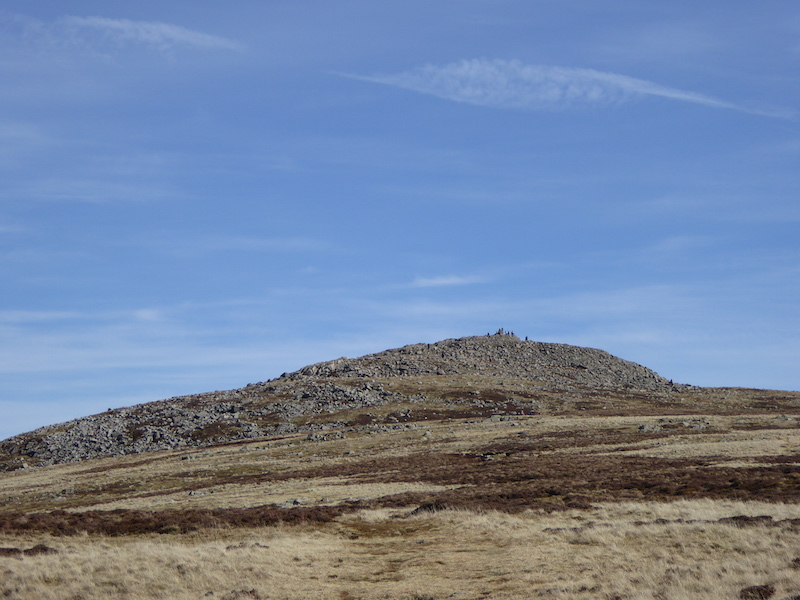 A close up of Bowscale Fell. 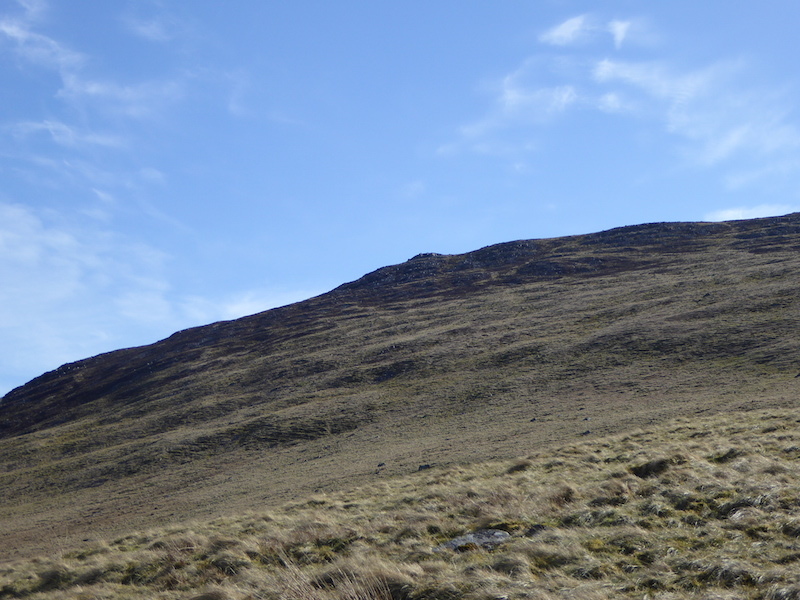 Bowscale Tarn, in the huge bowl just below the ridge, is just visible if you zoom in. 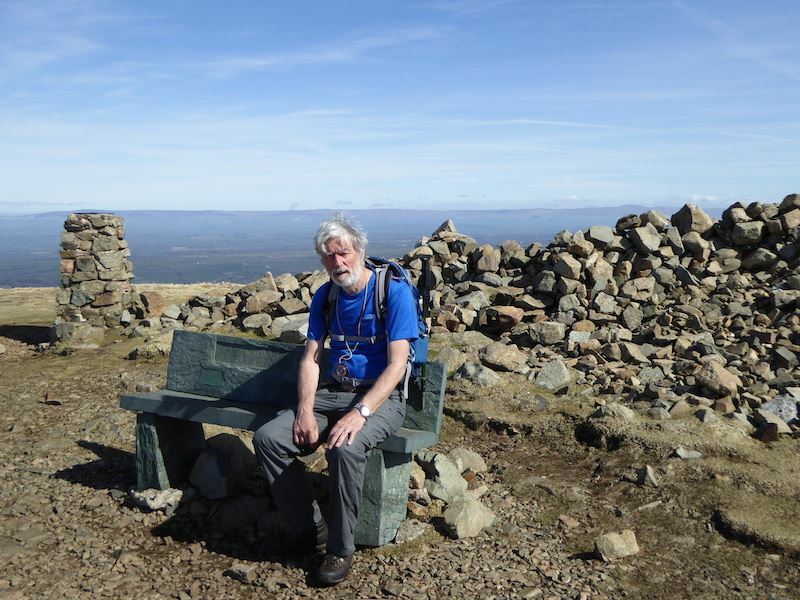 Taking a rest on High Pike. There was a lovely cooling breeze up here, although it didn’t do much for the hair style. 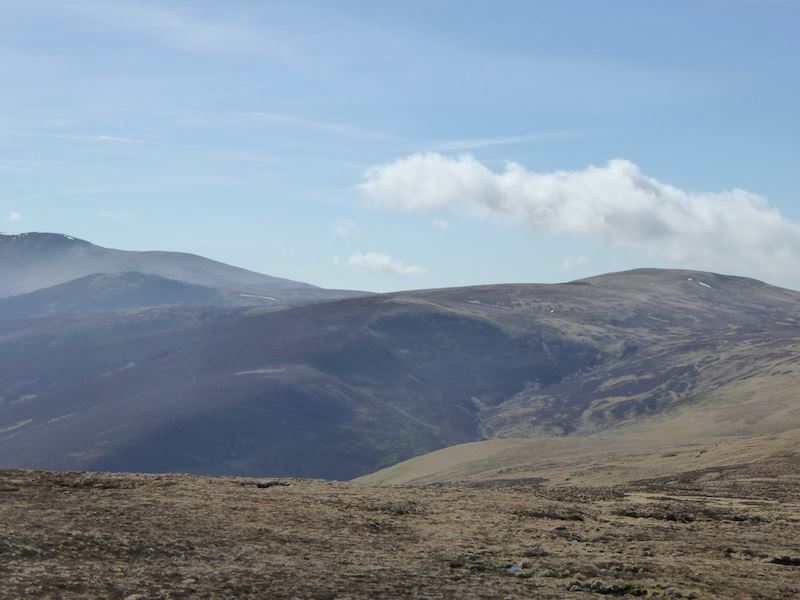 A look back at High Pike as we make our way over to Carrock Fell. There were a few people about but you could hardly call it crowded could you? 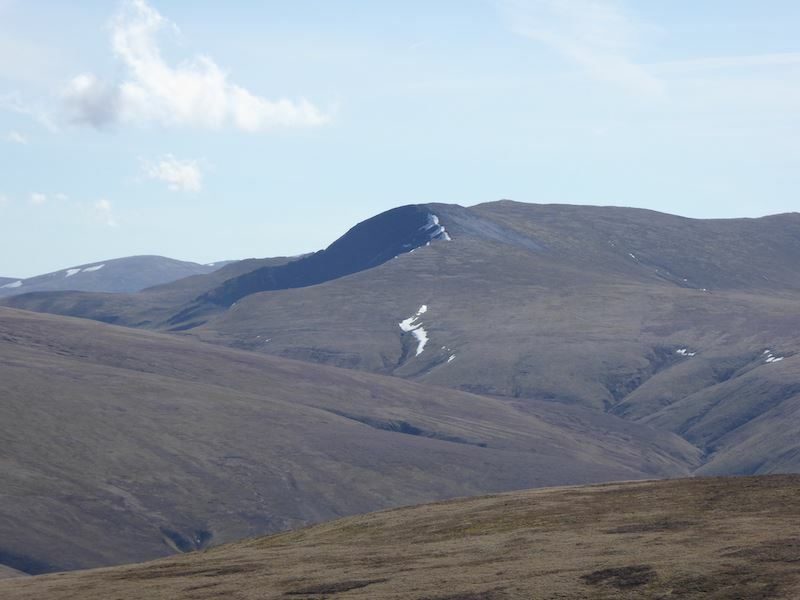 Helvellyn, Skiddaw, the Langdale Pikes and other such hot-spots would have been like Piccadilly Circus today. A look forward towards Miton Hill with Carrock Fell just behind it, you can really get into a good stride going along here. 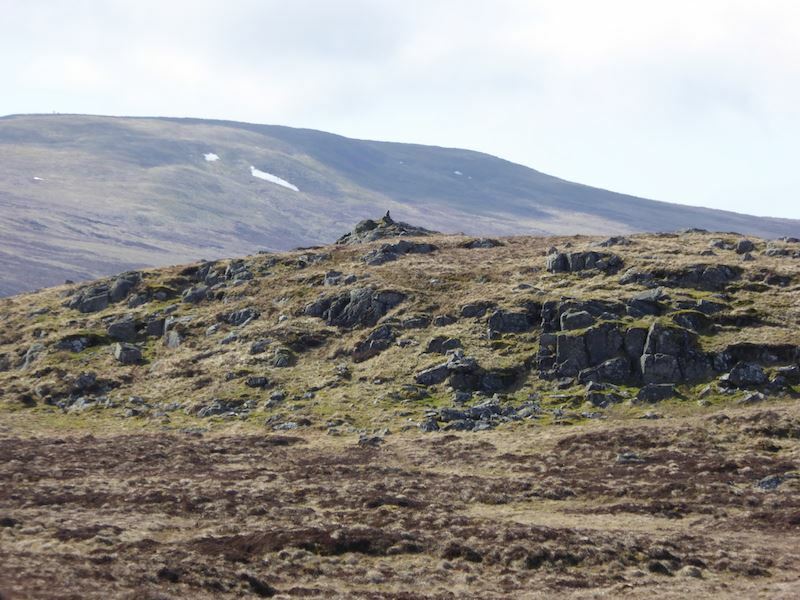 Carrock Fell from the cairn on Miton Hill. 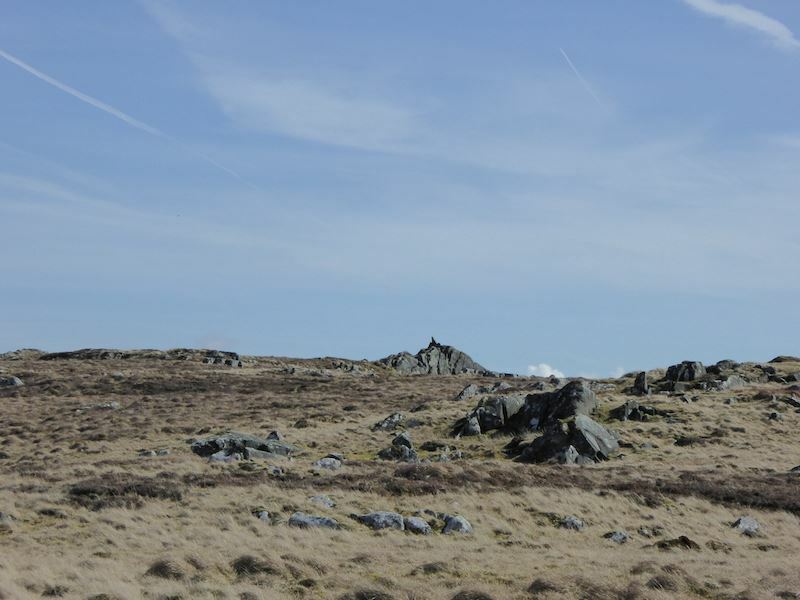 Rocky outcrops on Miton Hill, it was extremely boggy across here today. 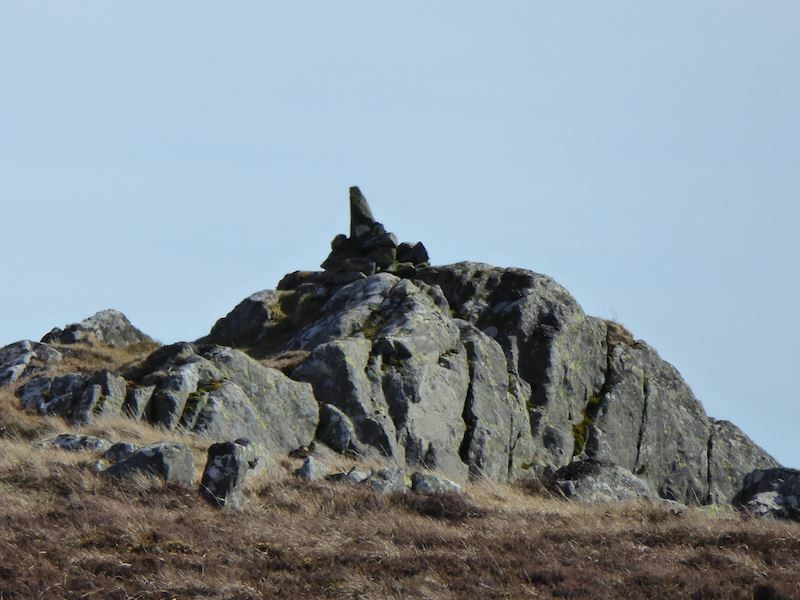 The rock outcrop marking the summit of Round Knott. 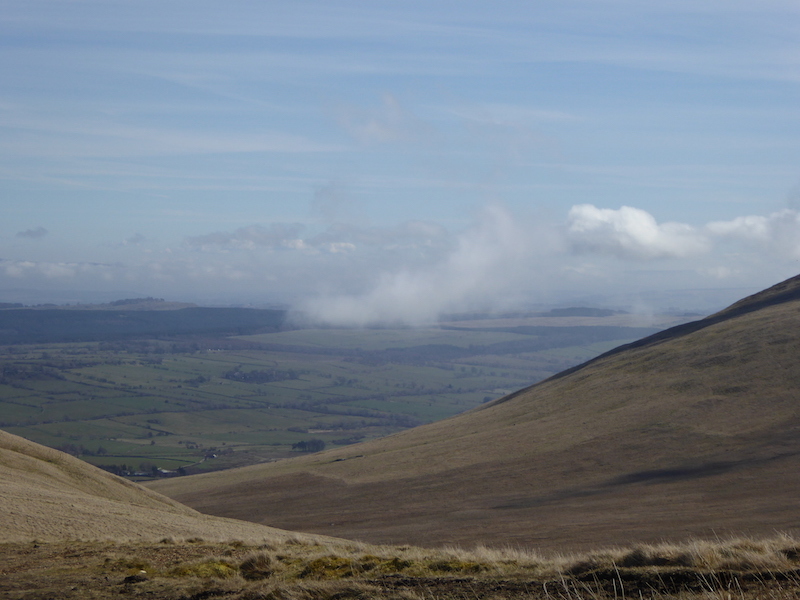 Looking east over another outcrop on Miton Hill. 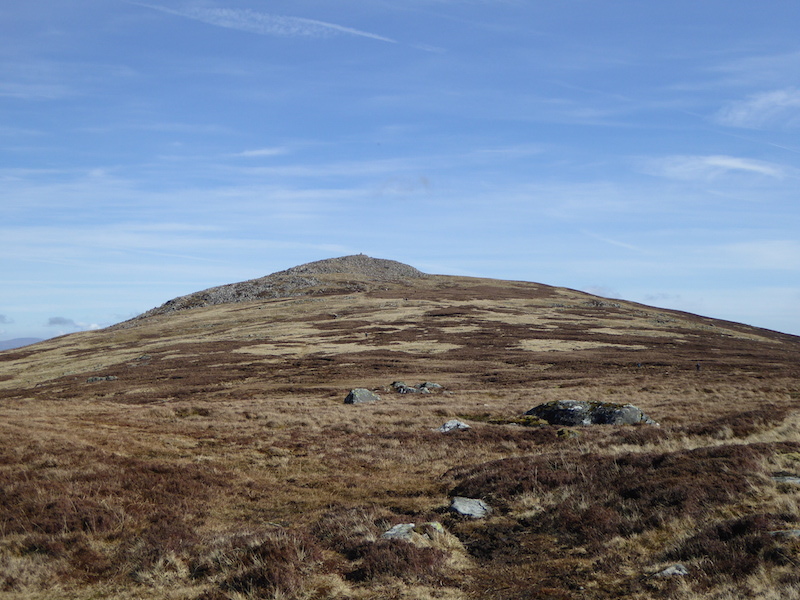 Heading towards the summit of Carrock Fell but it wasn’t possible to walk in a straight line, lots of zig-zagging was needed to avoid the boggy areas. 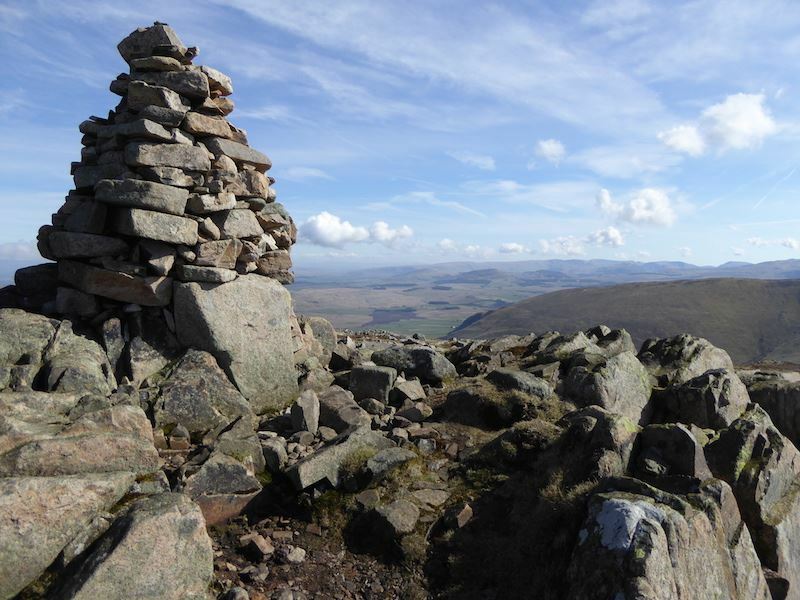 Hmm, it looks busy over on Carrock Fell summit. 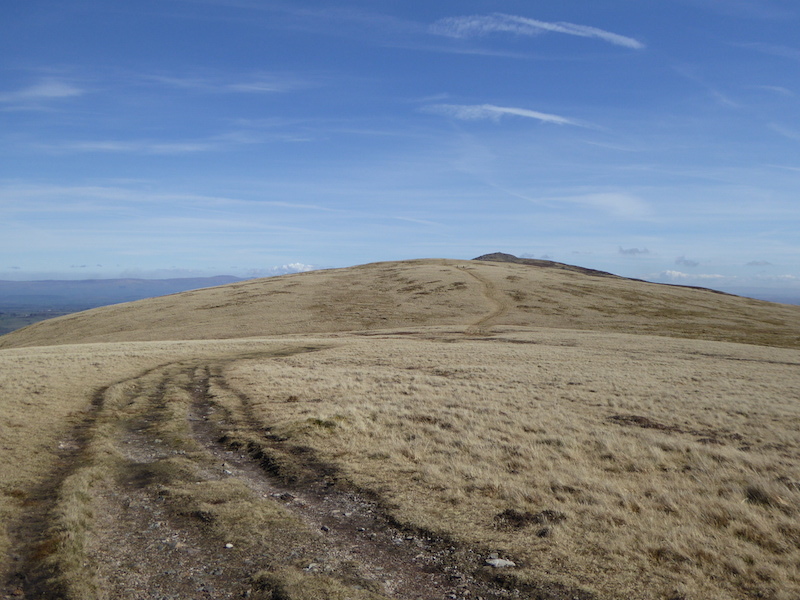 Looking back at Round Knott. 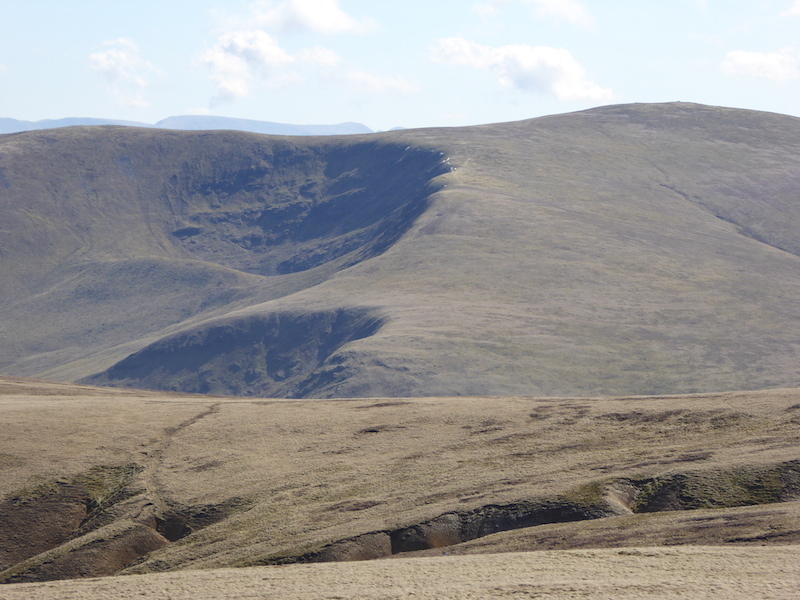 Looking back across to High Pike from Carrock Fell. 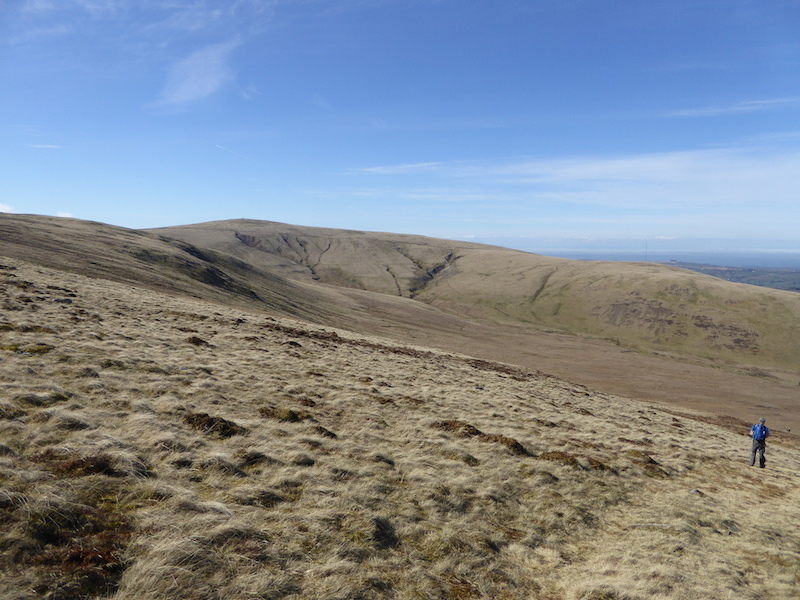 Some of the northern fells come into view as we continue up Carrock Fell. 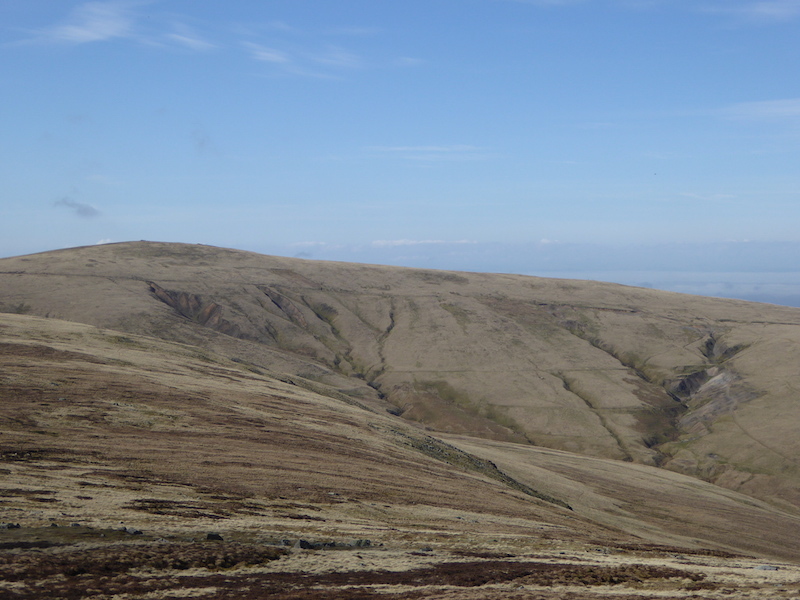 Over on the far right is Knott. 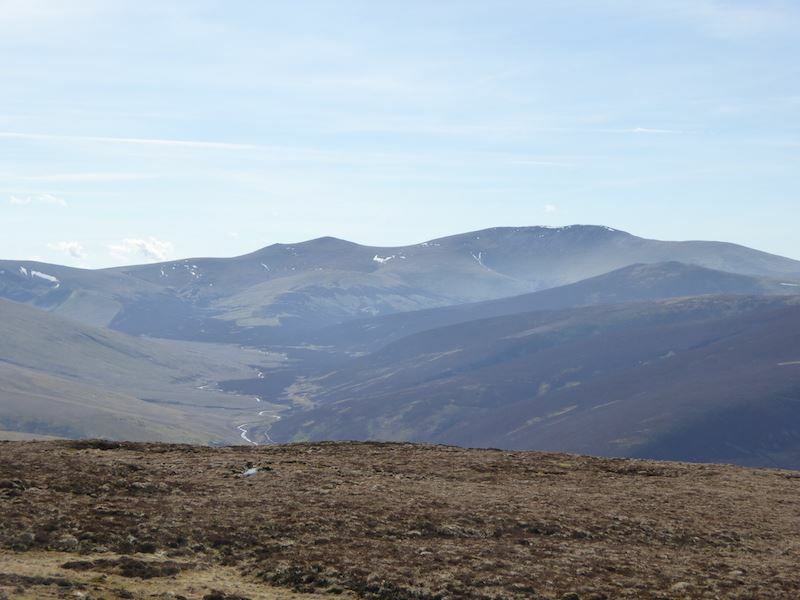 The Skiddaw massif on the skyline. 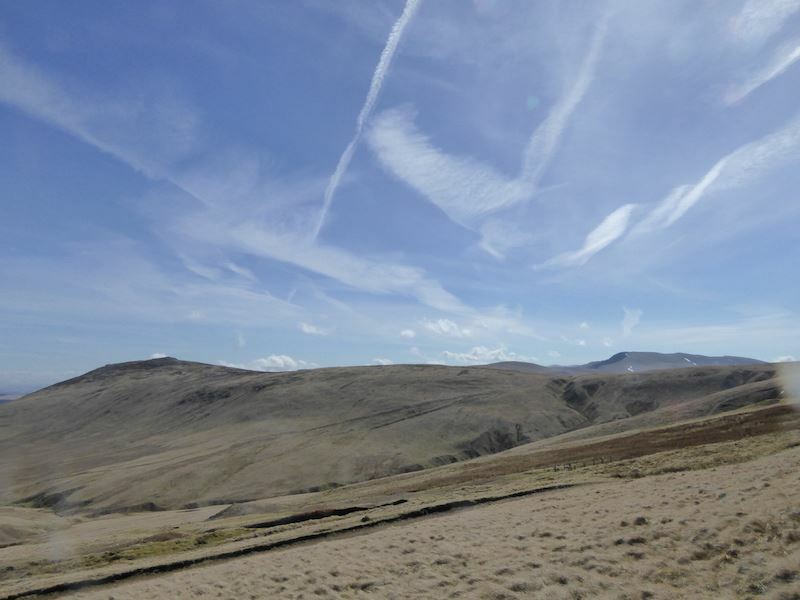 Bowscale Fell but its tarn is hidden in the bowl of the fell.. The River Caldew down in the valley bottom with the Cumbria Way footpath alongside it. 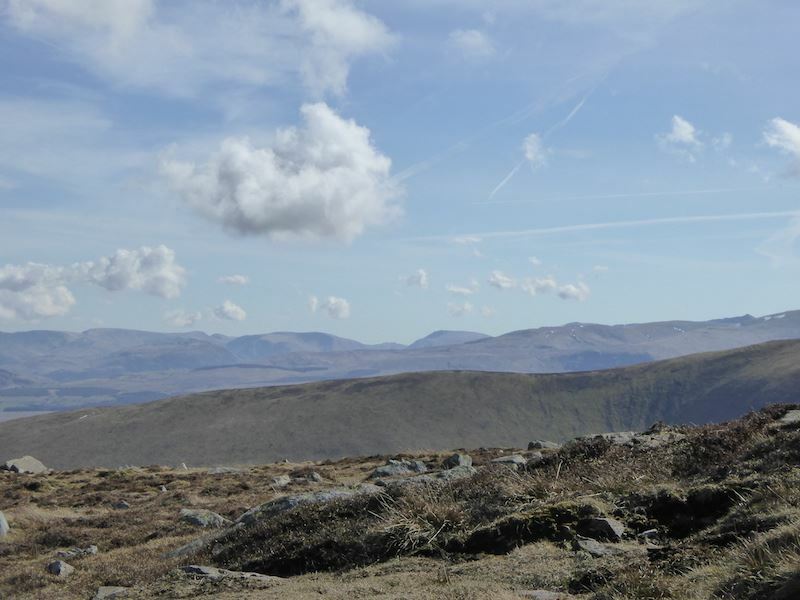 Looking over at the Far Eastern fells as we walk along to Carrock Fell summit. 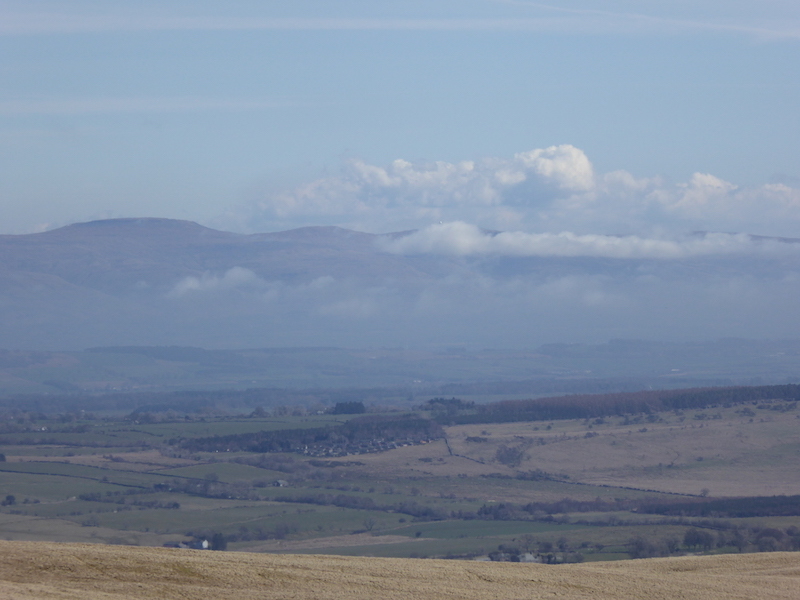 Getting a bit hazy now towards the Eastern fells. 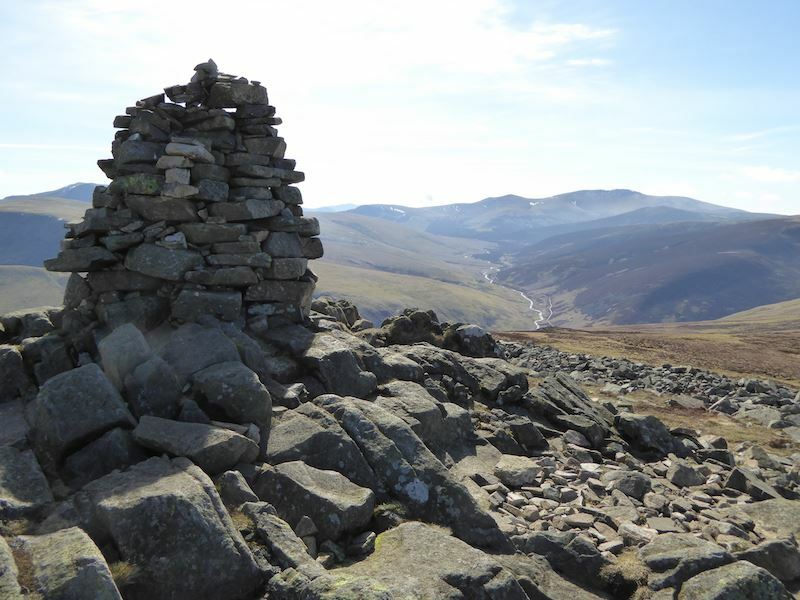 Carrock Fell summit cairn, with Skiddaw on the horizon and the River Caldew down in the valley. We had to wait quite a while for the very large family group, who were already spread out all over the summit area, to gather up their belongings and depart. 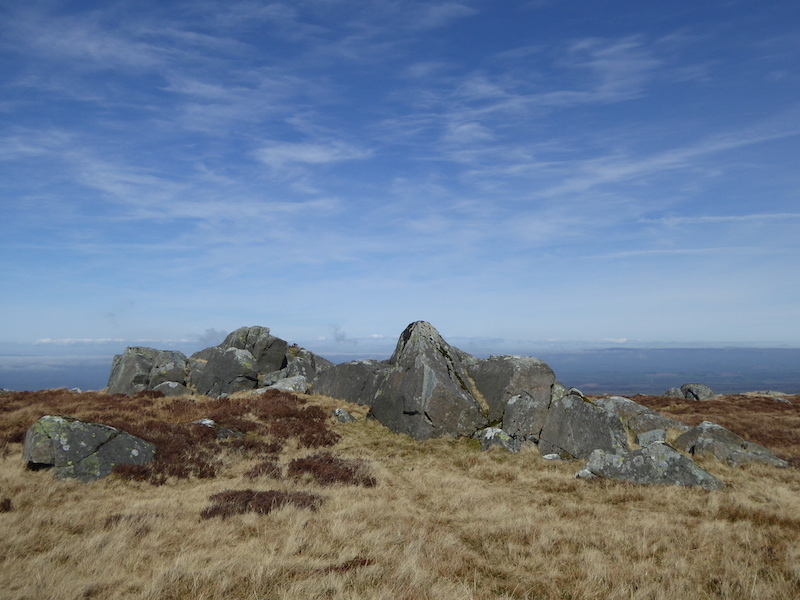 Looking eastwards from the summit cairn. 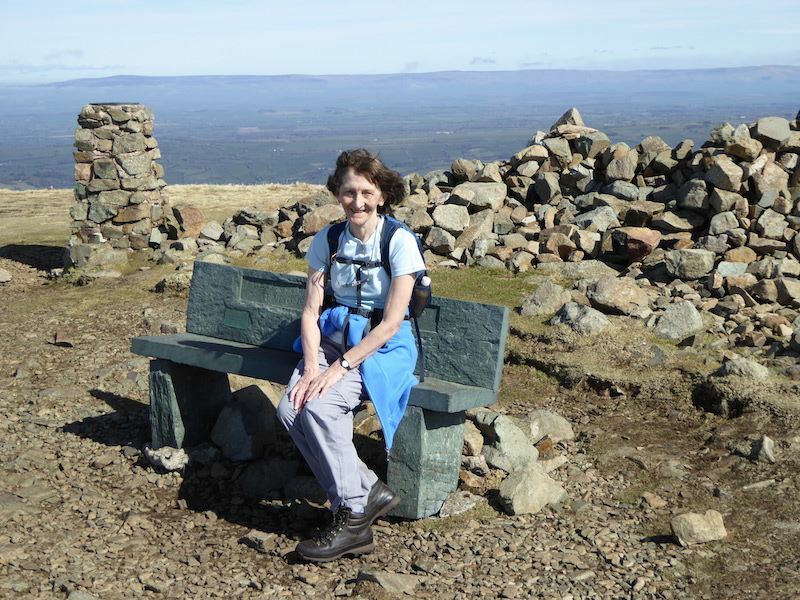 Soaking up the sun on the summit. As if by magic the long trousers had turned into shorts, it must be warm then. You never know what you’ll come across. 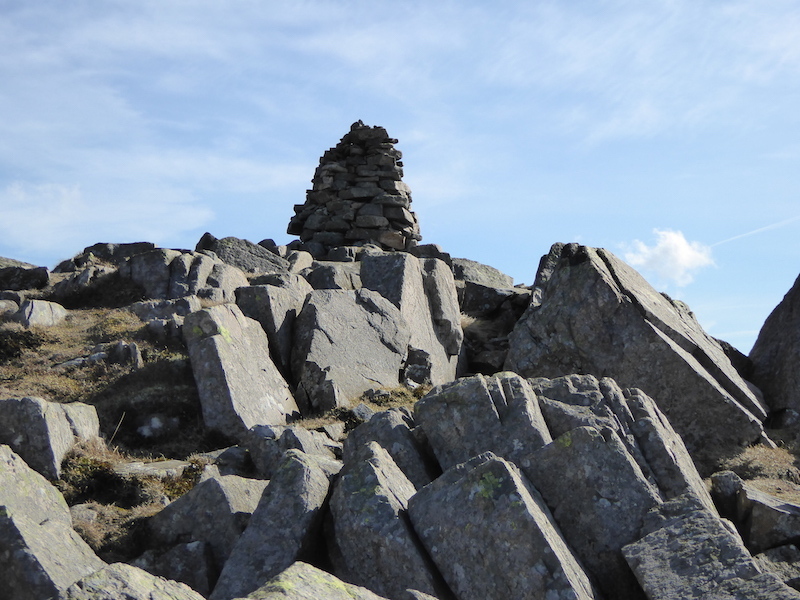 One last shot of the summit cairn as we leave. 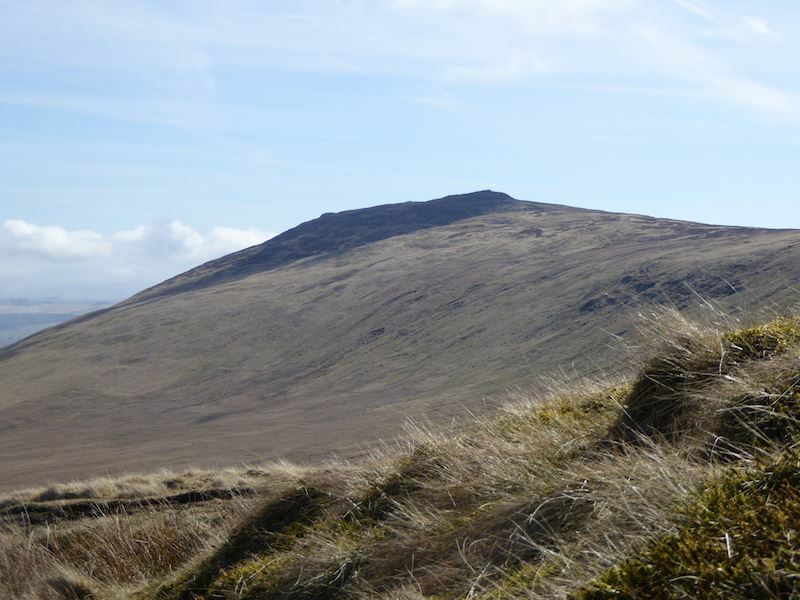 Making our way down Carrock Fell with High Pike in full view. 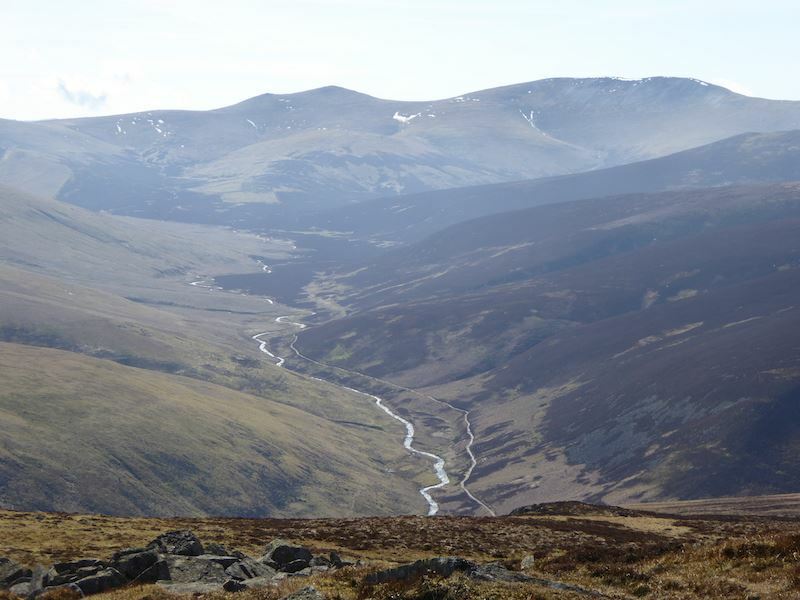 Looking eastwards over the valley as we descend Carrock Fell. 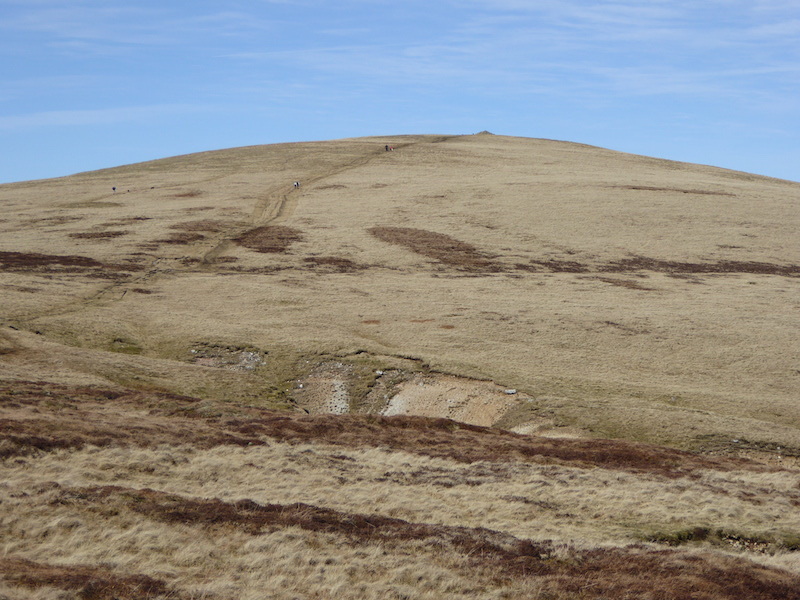 Looking back up to Carrock Fell from the descent path. 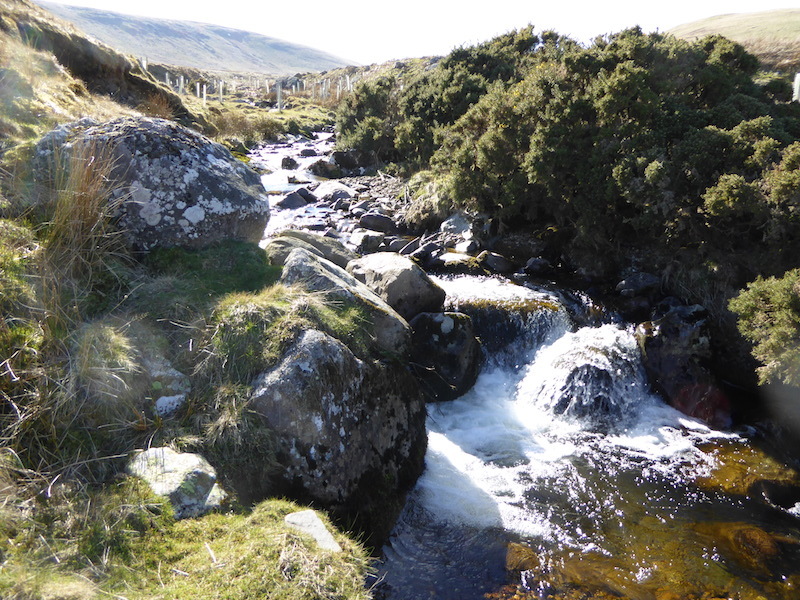 Now we have to find a place to cross Carrock Beck without getting wet feet. Its not very wide but jumping across isn’t an option here unless you want a face full of prickly vegetation. 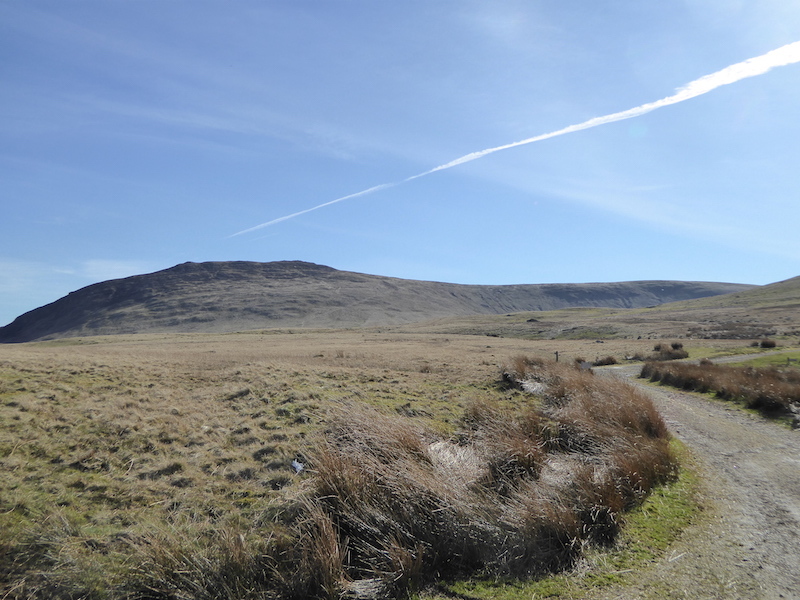 Back at the parking area and a final shot of Carrock Fell. 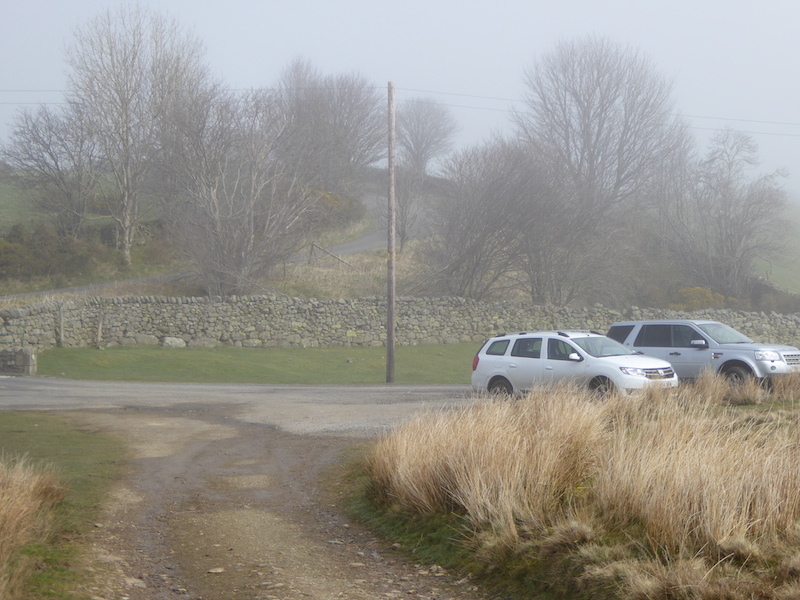 None of this was visible when we left here earlier, you could just about see as far as the nearest bend in the track. 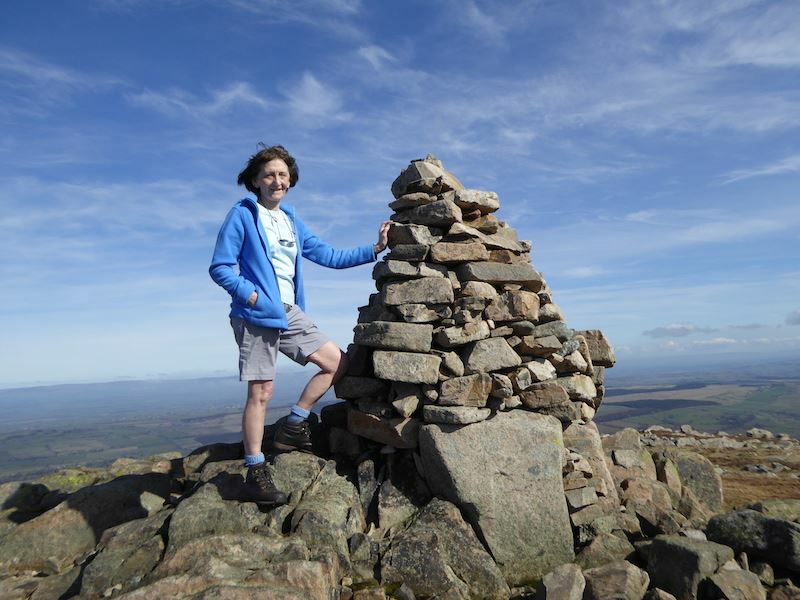 This must be the first Easter Monday for years that I have worn shorts and short sleeved t-shirt and spent the day outdoors in warm sunshine, let’s hope it lasts a bit longer.